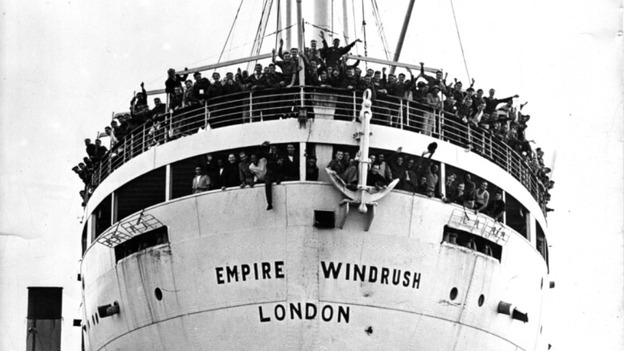 Empire Windrush. Grey ghost of war. and jungle camps. From last posts, and lowering flags. as Monte Rosa in a German yard. A cruiser for vacations, and the middle classes. Jews – endures air attacks and mines. Survives. by a government desperate for willing hands. of Trafalgar, Agincourt or Waterloo. skies rain blessings and surprise. to fill the shortages they’re here to satisfy. she burns and sinks, her contribution made. them room, and heritage adds on another page. suddenly awake finds new rhythms in its feet. whites to close the door on opportunity. forgets the rights of man, the promises of war. the yearning back to their hovels or the sea. feel clerks’ indifference with quotas to fulfill. and adds more depths to English as it goes.